TORONTO - The CFL and Calgary Stampeders have reached a compromise on Quick Six. 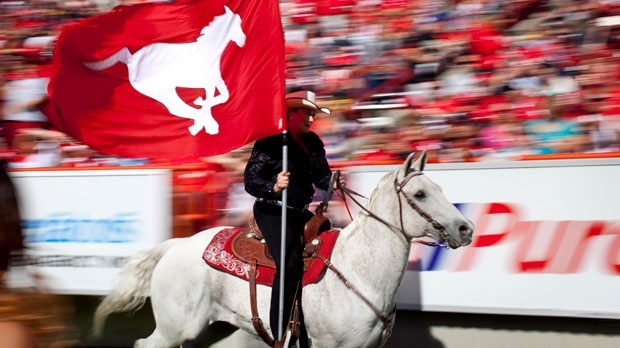 The league announced Thursday the Stampeders horse mascot and rider Karyn Drake will be on the sidelines at Rogers Centre on Sunday when Calgary faces the Toronto Argonauts in the 100th Grey Cup. But Quick Six won't be able to gallop up and down the sidelines when Calgary scores due to a lack of available space and safety concerns. Drake and Quick Six charges down the sidelines at McMahon Stadium when the Stampeders score a touchdown. The compromise comes after league and Stampeders officials met to discuss concerns the mascot wouldn't be allowed to make the trip to Toronto. The Stampeders arrived in Toronto Tuesday to begin preparations for the Grey Cup but Quick Six and Drake remained in Alberta.